The ZEISS SUGAR TESTER is a pocket optic refractometer made in Germany, useful to know the sugar content in fruits juice. The combinations of small size, lightness, and technology, makes this refractometer the most accurate of the market in his class. 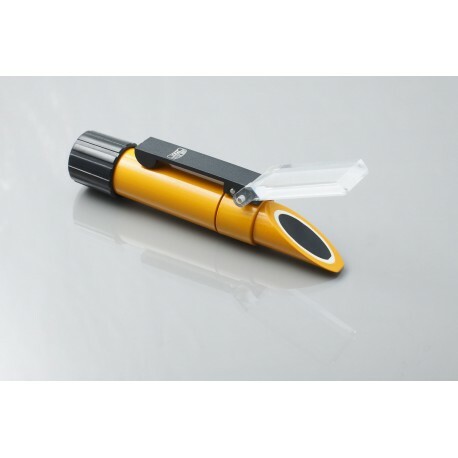 - Is the smallest and lightest refractometer in the world with 0,1% accuracy . - - Manufactured by Carl Zeiss Jena, has the best precision optics. - - Doesn't need to be calibrated, is already factory calibrated. - - Bargain price while stock last. 1.- Put a drop of juice over the lens with the cover of the lens up. 2.- Close the cover carefully over the drop. 3.- Focus the eyeglass to a light source. 4.- You can see the value in Brix or Oechsle degrees of the juice. Direct reading of sugar content in BRIX (grams of sugar content in 100 grams of product), or in OECHSLE (weigh of grape juice in 100 grams of product). Ranges: 0 to 35 ˚Bx and 0 to 150 ˚Oe. Accuracy: ±0,25 ˚Bx ó ± 1 ˚Oe. Adjustable eyeglass to fit the diopters of the user. § In vineyard growing to determine the degree of maturity and the quality of the grape. § In the juice industry of fruits, to control the quality of the fresh grape. § In order to classify the quality of grape juice on the basis of the "weight of must" according to the Oechsle degrees. § In the conserve factories to control the juice of fruits and vegetables. § In the cultivation of sugar beets and sugar cane plantations to verify the maturity degree. Measures in two scales: ºBrix and ºOechsle.